Opals come in a brilliant range of colors. The white variety, based in Hungary, is the most common, featuring flashes of color against a white, almost translucent, ground. Black opal, one of the more prized forms, pictured here, exhibits a play of color against a dark ground. Although long admired since ancient times, this luminescent gem once had dark associations. 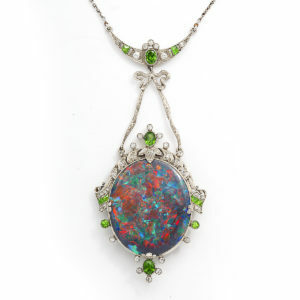 Nineteenth-century American poet Hannah F. Gould described opals as “the gem with the burning heart,” referring to the luminous spot that changes position in the light. Sir Walter Scott must have made a similar observation, suggesting the stone as a life source in his 1829 novel Anne of Geierstein. After the opal worn in Lady Hermione’s hair is sprinkled with holy water, it loses its color, leaving her ill, and the following day, reduced to ashes. Increased popularity of the novel encouraged superstition of the stone, deeming it unlucky. Such superstition arose from misunderstanding of the stone’s delicate nature. Because of its high water content, it is particularly sensitive to sudden climate changes. While Sir Walter Scott exaggerated this sensitivity, it should be noted that the stone can crack under dry conditions, or rapid changes of temperature. Fear of the opal quelled somewhat as Queen Victoria became known for giving opal jewelry as wedding gifts. Further helping to quench superstition was a rekindling of the opal market from the discovery of black opal in New South Wales, Australia in 1877. In this age opals are revered once again. So long as it’s taken care of, the burning heart endures.